A group of us stayed in Casa Tabachin for a week. The house offered everything we needed and more! The staff couldn't have been more friendly and helpful! Fernanda our concierge assisted with everything from daily needs to booking excursions. Our chef Luis is solely responsible for all of the weight we gained this week with his amazing cooking! The rest of the staff Lala, Ana, and Juanna were helpful and friendly and they took great care of us throughout the week. They became a part of our trip and we loved interacting with them and getting to know them better. The bedrooms are on 4 different levels of the house so we were able to spread out and each have our own spaces. There are multiple living rooms so it's perfect if you want separate places for kids to play and adults to interact. The open-air dining room is a special space as it offers a spectacular view of the Romantic Zone of PV. I wholeheartedly recommend Casa Tabachin to anyone looking for a large home with plenty of space for a large group or family! First of all, we thank you very much for taking the time to visit our Tripadvisor to share everything about your stay at Casa Tabachin. We are more than happy to know that you and your group had an excellent experience with us. These type of comments always motivate us to continue to provide great service so that our guests leave with unforgettable memories and, of course, a smile. We hope to see you back at Casa Tabachin and we wish you all the best! This is our second year staying at this spacious old world charm Mexican villa with modern creature comforts and amenities. Our friend Jonathan B has been visiting for years and has convinced dozens of us from Beantown to pay a visit over the past few years. The eight bedrooms (each with their own en suite bathrooms) are dispersed throughout four different levels. The owner Raquel, Doña Lala (and the rest of the house staff), and Katia the concierge all do an amazing job of making your stay truly special and personalized. The hillside property is within a very short 5-10 minute distance of mostly everything the old town downtown Zona Romantica, Gringo Gulch and Malecon beach promenade / boardwalk. There are daytime and sunset views to be had from various levels on the property. On behalf of the staff at Casa Tabachin, we thank you very much for taking the time to visit our Tripadvisor and leave your thoughts about your experience. We are proud to know that this is your second year visiting us and that your experiences have been nothing but great. We hope to see you soon at Casa Tabachin. Have an excellent year! This will be our 8th year staying at Casa Tabachin and let me tell you, this place does not disappoint! Every aspect of the experience of staying in this gorgeous home is heavenly. The staff is incredible. Lala's exquisite meals will leave you amazed and feeling like you went to a fancy upscale restaurant. 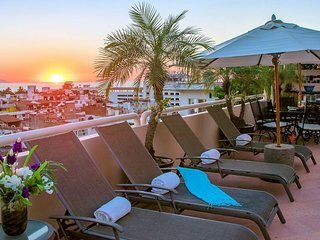 The breathtaking views from the pool of the city, mountains, and Puerto Vallarta's amazing sunsets are unforgettable. The home is decorated with an artists eye, as the owner is well-known in the PV arts community. 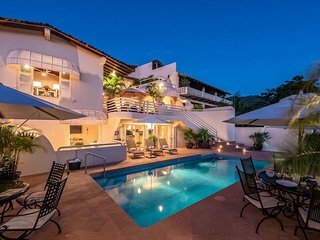 The home is located just steps away from the Elizabeth Taylor's House (Casa Kimberly), and steps away from some of the best restaurants in all of PV. Every bedroom is comfortable and has its own private bathroom. There's a lovely hot tub just outside the master bedroom. In addition to the bar at the pool, there's another bar located up on the 2ndl level veranda. The living room is perfect for reading and napping with the window opened with a slight breeze blowing in. It's magical. The 2-bedroom casita is equally as gorgeous and well appointed. If you're trying to decide on a gorgeous place for your family or group, Casa Tabachin will exceed your expectations. Truly. We are more than happy to know that you are a recurring visitor to Casa Tabachin and that all of your experiences with us have been pleasant. These types of comments motivate us to continue to offer an excellent service to all of you, and we hope to see you soon in Puerto Vallarta. Thank you for taking the time to leave your opinion and recommendation. 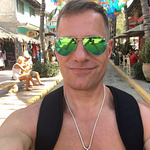 Looking for a place to stay in Puerto Vallarta?